Think that dead superheroes being resurrected as murderous zombies is limited only to DC's Blackest Night? Think again; Marvel's X-Men franchise is also preparing to be invaded by the undead in time for Hallowe'en. This is our chance to bring back some characters that have been lost to us. Some that we killed. Many. 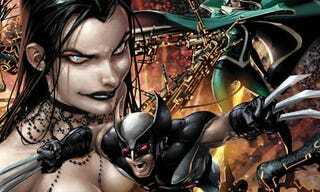 Amongst those promised to return are the victims of 2001's Genosha massacre, which launched the critically-acclaimed X-Men run by Grant Morrison, as well as fan favorite characters from recent titles like Young X-Men and New X-Men. The storyline will begin in a one-shot special Necrosha issue, available in October.